A drum in my personal collection manufactured by J. C. Haynes & Co. bears a fantastic label inside which reads in part: "Manufacturers and Importers of Brass and German Silver Musical Instruments. 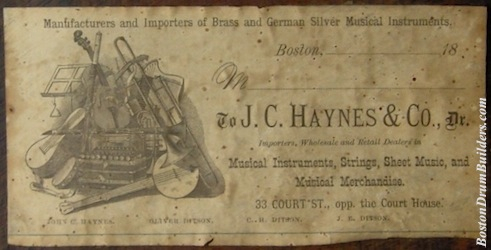 / J. C. Haynes & Co., / Importers, Wholesale and Retail Dealers in / Musical Instruments, Strings, Sheet Music, and Musical Merchandise. / 33 COURT ST., opp. the Court House. / John C. Haynes. Oliver Ditson. C. H. Ditson. J. E. Ditson." Left incomplete, however, are the blanks where the date and owners name can be filled in. Even upon close inspection, no handwriting can be made out. One theory as to why this information isn't present is that the ink has simply faded over time. It now appears more likely that these blanks were never filled in at all. We can say this with a bit of confidence after comparing it with another similar instrument. The example seen below was recently offered up on ebay by a seller from Texas with the username "all_things_peacock". The drum is quite similar to mine, especially upon viewing the shells from the inside. 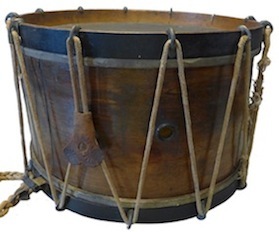 Both drum appear to be made of a dark hardwood and have narrow reinforcing rings made of a lighter colored wood at each bearing edge. The labels on these two instruments are a perfect match which helps solve a bit of a mystery as to how old my own drum is. Past research showed that the address on a Haynes label by itself was not enough to accurately date a drum beyond a decades wide window spanning most of the later half of the 19th century. But this new label, complete with a hand written date provides a firm point on the timeline. September 9th, 1880 it reads, which happened to be a Thursday for what it's worth. For more information on John C. Haynes and their parent company Oliver Ditson, please visit BostonDrumBuilders.com. 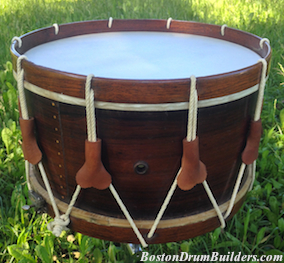 And as always, I love hearing from folks about old drums so feel free to drop me a note at lee@vinson.net.